Xtasea is Acapulco’s latest attraction and it has one mission: to fulfilling adrenaline thirsty people by letting them fly over the sea in the world’s longest zip line. All of this with the beautiful Puerto Marqués’ Bay as scenario. Xtasea guarantees you the safest experience due to its highest-level architecture made under the strictest international quality standards. Moreover, the safety equipment provided to assure your safety is internationally well known. As our commitment to your enjoyment and safety goes beyond your flying experience, a shuttle will provide you round transportation to our station, where you will have the opportunity to enjoy our select amenities. 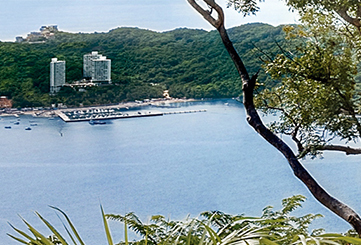 Our touristic and business complex, Mundo Imperial Acapulco and Grupo Autofin México, strong companies with more than 30 years of experience in Mexico, endorse this great adventure fulfilling their commitment to restore Acapulco’s public image while offering the best to its visitors. We aim to be recognised as the best adventure attraction in Mexico, characterised for our safety and amenities that will offer an extraordinary experience to our visitors. To offer a worldwide famous touristic attraction that widens Acapulco’s entertainment portfolio.